In System Preferences > Mouse there's a setting "Scroll direction: natural", which I don't like, so I unset. The problem is that this also unsets the setting for Trackpad, which I do like. How can you have different settings for mouse and trackpad? I had the same problem when I started to use macOS. It appears that this is integrated in the Karabiner app so it works out of the box without any custom XML (which are described above). 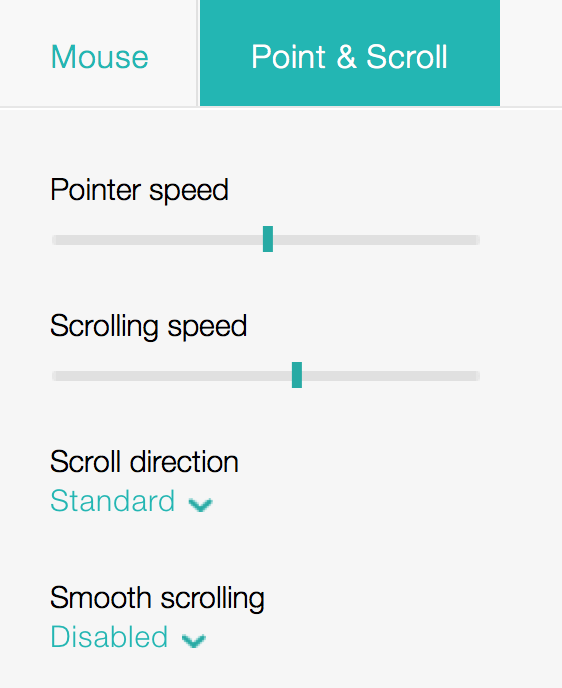 Set the Enable Natural Scrolling setting in the Mouse/TrackPad PrefPane to 'enabled'. This allows for the internal trackpad to work as it's supposed to. Any connected non-Apple external mouse will scroll in their own natural way. I found myself in the exact same boat (preferring Natural for TrackPad and normal for Mouse), and in case anyone attempts to do the same, I did file a bug report against Apple for this. They closed it rather briefly with the words "This is intentional" and no other explanation. I'm guessing that it's a common request, and they're just tired of hearing it. You can see the vendor and product IDs from /Applications/Karabiner.app/Contents/Applications/EventViewer.app. As Tien posted, Logitech now has an app with the option to separate trackpad and mouse scroll directions, but this only works with a unifying receiver or Bluetooth. I have a wonderful Logitech VX Nano that I don’t intend to give up on, which pre-dates unifying receiver. And Karabiner or Scroll Reverse do not currently work on Sierra. Instead you can use the free app Reverse Scrolling, which works on Sierra. Having scroll direction: standard here and natural scrolling on macOS Sierra settings make it work as it makes sense: natural scrolling on trackpad (two thingers up scrolls down) and standard scrolling on the wheel (roll the wheel "back" scrolls down). 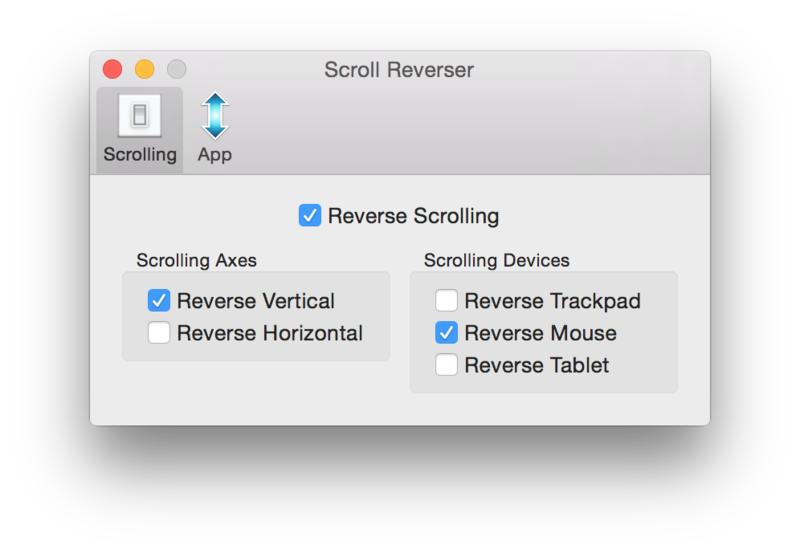 Change Key tab > Pointing Device > Reverse Scrolling Direction Select "Reverse Vertical Scrolling"
From here, use Apple > System Preferences > Mouse (or touchpad) and select "natural scrolling"
Both Karabiner and Scroll Reverse do not work on Sierra so far (October 2016). I use a logitech M185 and the app from Logitech instead (http://support.logitech.com/en_us/product/wireless-mouse-m185) and it works. Now I can separate the scroll direction between the trackpad and the mouse. Not the answer you're looking for? Browse other questions tagged mouse trackpad system-prefs . Is it possible to automatically switch between scrolling?